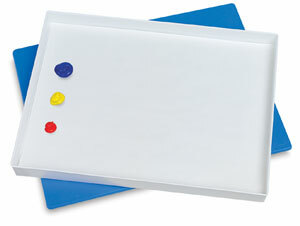 Save paint, time, and money with the Masterson Sta-Wet Palette Seal, an airtight container for storing a wet palette. It preserves the freshness of your paints for many days, saving you from having to clean your palette after every painting session. For oils, place your favorite type of palette (wood, glass, plastic, or paper) into the Palette Seal tray and snap on the lid. Made in the USA of tough yet lightweight plastic, the Masterson Sta-Wet Palette Seal measures 1¾"H × 16"W × 12"D (4.5 cm × 40 cm × 30 cm).